BEIJING — He held up stalks of wheat and made small talk with farmers. He stood side by side with workers at an oil plant and spoke of building an “invincible” China. He called for China to become more “self-reliant” in the face of a trade dispute with the United States. Mao was a master of propaganda in rural settings, using images and songs to highlight his concern for the common worker and to cultivate a paternalistic, caring image. Mr. Xi, who has been criticized for inspiring a personality cult with parallels to the Mao era, has taken note. 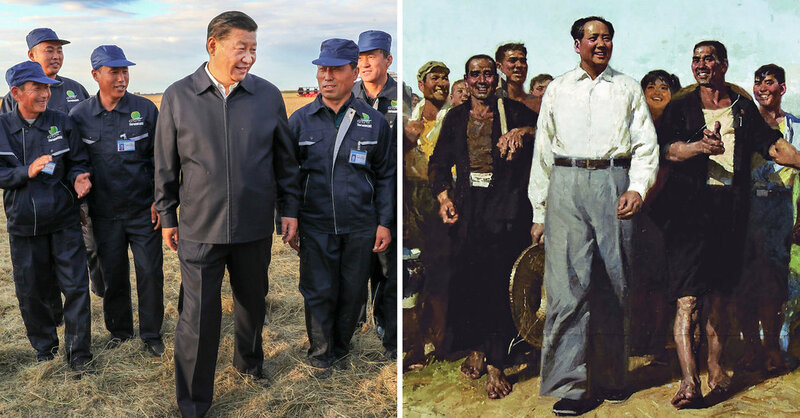 In one image from his tour of a farm in Heilongjiang Province, Mr. Xi is shown under an idyllic blue sky, confidently stepping forward while an adoring crowd of farmers looks on. The image is familiar. Its arrangement mimics the look and feel of painted propaganda posters from the 1950s, which often featured Mao mingling in bucolic settings. “This is a visual sign not just of Xi’s current predominance, but of his claim to historic greatness,” said David Bandurski, co-director of the China Media Project, a research program affiliated with the University of Hong Kong. He said that Mr. Xi added a modern twist to the rural imagery, with a row of combine harvesters looming in the background to showcase China’s technological advancements. Pang Laikwan, a professor at the Chinese University of Hong Kong, said Mr. Xi, who grew up during the chaos of the Cultural Revolution, seemed to have learned much from Mao’s personality cult, including his populist appeal. “Mao himself also has this genuine interest in communicating with ordinary people, which constitutes part of his charisma,” she said. In this video, Mr. Xi, his hands folded behind his back, strikes up a conversation with a worker at an equipment manufacturer in Qiqihar, a northeastern city. “Are these raw materials domestically made?” he asks. “Yes, all of them,” the worker responds. Mr. Xi nods approvingly. Mr. Xi used his visit to reiterate calls for China to move more quickly to build its own technologies, so that it is less dependent on the United States. With trade tensions growing between the two countries and threatening supply chains, Mr. Xi has spoken frequently about the need for China to develop its own microchips, software and other technologies, part of its strategy to become a leading superpower of the 21st century. Throughout the tour, Mr. Xi called for “zili gengsheng,” or self-reliance. At one point, he picked up a rice bowl and said, “Chinese rice, Chinese rice bowl,” emphasizing his call for domestically made products. Since coming to power in 2012, Mr. Xi has faced criticism for doing too little to shake up bloated state-owned companies, which dominate sectors like telecommunications and steel. Mr. Xi made it clear during his visit to the northeast, which was almost entirely dominated by state-owned companies, that he was not about to change course. “Any thoughts and opinions that doubt or sully the name of state-owned enterprises are wrong,” he said, speaking to a crowd of workers at Liaoyang Petrochemical in Liaoning Province on Thursday. State-owned firms are often criticized for focusing too much on maintaining employment for workers instead of creating innovative business models.